Rosehaven Cottage: Rain, Glorious Rain! After many months of no precipitation, we have finally welcomed our first significant rainmaker storms of the season! We usually don't have rain from about May through September. But this year is stretched out a bit longer. Our soil desperately needed the rain, and it got it. We've received about an inch and a half since Halloween, and it's wonderful! Other neighboring micro-climates in the Greater San Francisco Bay Area received more--up to 5 inches in the Santa Cruz mountains where the big redwoods grow. I snuck out between downbursts and shot some photos of raindrops on roses (one of my favorite things--just like Maria Von Trapp). I am always struck by how beautiful raindrops on flower petals look. And today my Auntie came to visit me for the day. As we toured the garden, we got caught in a downburst. It felt great! We managed to pick three nice pomegranates off what's left of this year's pomegranate crop for my Auntie to take with her. Picking pomegranates in the rain with my Auntie... I can't think of a better thing to do on a November afternoon. 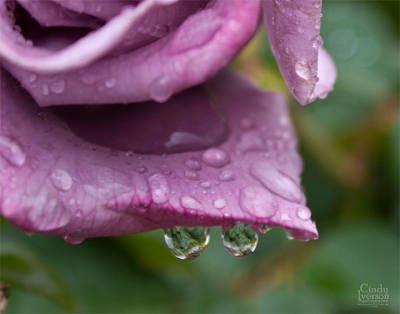 Your raindrops on roses are beautiful! I bought my first ever pomegranate this week to try! I am going to have it tomorrow. Those are beautiful. I especially like the white flowers. BTW, if you like rain, I can tell you where you can get enough to float a boat with. We're heading in to our rainy season up here on the wet coast (that was no typo, btw). Some of your best shots yet. I love raindrops on roses, too. What is that in the last photo? It's beautiful! Beautiful photos! I love walking in the rain too. 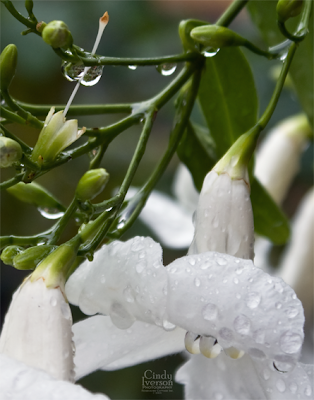 Beautiful raindrops on beautiful flowers. I'm glad you got some much needed precip! I should have identified the white flower for everybody... it's a "Lady Di" Bower Vine. Even though the label said it blooms from May to June, we have blooms probably 9-10 months out of the year. I prefer sunshine on rose petals. ;-) Glad you finally had some rain Cindy. It looks like your garden really needed it. Sounds like great fun picking pomegranates with your auntie! I absolutely love these raindrop photos! I love the distorted micro images in each drop. I wish I could capture some of those. I love rain drops on flower petals too and your photos capture them perfectly! I think I would've been dancing if we hadn't had rain in that long here. As it is, so far November has been wet and joint achingly so.